As evening fell on Neopia Central, it was time for Kora the Poogle's nightly bedtime story. Her mother Eppa knew an endless supply of bedtime stories, for she'd loved them since her youth. Of all the stories Eppa knew, Kora's favourites were the ones about the faeries. "Mum, Mum!" Kora pleaded. "Please tell me a faerie story..."
"Which of the faeries would you like to hear about tonight, darling?" Eppa asked. "Oh, let me see," Kora mused. "As you know, my favourite is the Space Faerie. But you told me a story about her for bedtime last night. Hmmm... I think I'm in the mood to root for the bad guy. How about a story about a Dark Faerie? Why yes, I think that a story about a Dark Faerie would suit me nicely." "Okay, dear, I think that can be arranged." Eppa thought for a moment, then began: "Alright, well, our story this evening begins not in Faerieland, but rather on Mystery Island, with a Kougra named Raitorn. Having graduated first in his class at the Training School, Raitorn soon began a great career as a Battledome combatant..."
"But, Mum," Kora interrupted, "why haven't I heard of him?" "Well, you see, honey," Eppa explained, "this story takes place a long, long time ago, far before your time. This story is actually an old legend, which has been passed down for many generations." "Oh, I see," Kora said. 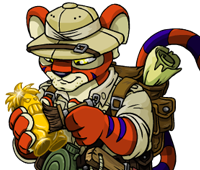 Eppa continued: "So we have Raitorn the Kougra, the fiercest competitor in all of the Battledome. When he'd won thirty matches in a row, they made him start competing with one paw tied behind his back. After he won his fiftieth straight match, he had to start fighting two opponents at a time. Well, pretty soon there was no one left. Raitorn had defeated everybody, and gone nearly two months without competing in the Battledome. He was starting to get bored. "Then one day, a Dark Faerie came down from Faerieland to pay Raitorn a visit. After filling Raitorn's poor head with a bunch of lies about how wicked and cruel the Faerie Queen was, the Dark Faerie mentioned that she could really use a general to lead her army in its attempt to overthrow that 'big-headed tyrant', the Faerie Queen. Not knowing any better, Raitorn agreed to do it: he'd lead her army against that of the Faerie Queen, which, as we all know, was lead by..."
"The Battle Faerie!" Kora shouted. "Exactly. And so," Eppa continued, "the Dark Faerie returned to Faerieland with her new general, Raitorn the Kougra. After a few weeks of whipping the troops (and himself) into shape, Raitorn assured the Dark Faerie that he was confident enough to head into battle against the Battle Faerie. "Emerging from the clouds, Raitorn's army confidently headed for the Battle Faerie's camp. Apparently, the decision to ambush the Queen's army had paid off. Caught completely off guard, the Battle Faerie and her soldiers were forced to quickly retreat all the way back to the Faerie Queen's fortress. Tattered and weary, the troops received a special visit from the Soup Faerie, who had come as soon as she heard of their embarrassing defeat. After making a special stew designed to nourish their bodies and brighten their spirits, the Soup Faerie encouraged the troops, assuring them that victory would be theirs as long as they gave it their best and refused to quit when times got hard. "The following day, the Queen's army was as good as new. With the kindness of the Soup Faerie in their hearts (and her delicious stew in their bellies), the troops rallied with renewed strength. Late that afternoon, the Dark Faerie gave Raitorn the order to surrender. Finally, the ferocious Kougra had tasted defeat." Just then, Eppa noticed that Kora's eyelids now hung heavily. With the fate of Raitorn's army sealed and the safety of Faerieland assured, Eppa kissed her daughter good night and turned off the lights.